Reese’s Black Russian: Ceres Vodka and a syrup made from Reese’s Peanut Butter Cups and Dark Matter cold brew is simply to die for. Normally made with coffee liqueur, we opted for something…a little more interesting. To make the syrup, add 2 oz Dark Matter cold brew, 2 Tblsp. Whole milk, and 2 tsp. powdered sugar into a saucepan. Heat on medium heat until the mixture steams. Chop up 3 Mini Reese’s (equivalent to about .75 oz, or 1 classic-sized Reese’s) and add into liquid. Stir until completely melted (this will take longer for the peanut butter, and we used a silicone spatula to break the candy apart). Pour into a shaker. Over the syrup, add the Ceres Vodka and dry shake your drink, completely combining all ingredients. Take a quick sip and, if you desire, add 1 extra teaspoon of powdered sugar. Stir, then pour over crushed ice into a glass, and garnish with a Mini Reese’s (or a Reese's Pumpkin!). Skittles Cosmopolitan – Cosmos are a classic drink, made with Triple Sec (orange liqueur), tart cranberry juice and lime juice. In this recipe, however, you will forgo the Triple Sec and infuse the vodka with orange Skittles as a substitute – adding both a sweet orange flavour and cool colour! Separate out all of the orange Skittles from your candy bag - you'll need at least 15. Place them in a jar that has a top. Cover with 3 oz. vodka and 2 ½ tsp. powdered sugar (or more, to taste). Screw on the lid and shake vigorously. Let sit for 20 minutes, shaking intermittently. While your vodka is infusing, pour cranberry juice and lime juice into a shaker. Once vodka is infused (the colour should be opaque and very orange), pour into the shaker. Shake vigorously with ice for 12 seconds. Strain into a martini glass and serve with a shot of Skittles! Breakfast Caffè Corretto With Almond Joy Bitters is the perfect way to wake up: Bitter, oaky, slightly sweet, and caffeinated, it's perfect for folks who need something a little less candy-like. For the bitters: Chop up 2 Snack Size Almond Joys into small pieces (Mounds work, too, if you have nut allergies) and place into a jar. Cover with ¼ cup Everclear and ¼ cup Rhine Hall Oaked Grappa. Let sit for several days to a week in a cool dark place, shaking the contents of the jar every day. Strain. For the cocktail: Head to Star Lounge (or your favourite coffee shop), and ask for a double shot of espresso in a small to-go cup (unless they allow drinking, in which case, ask for a small latte cup). Pour the oaked grappa and Almond Joy bitters in the cup. No need to stir. Sip and enjoy, while munching on Almond Joys in between. Candy Corn Mimosas are surprisingly delicious, even if you don't like candy corn. We infused aged rum with the corn, creating more complexity and depth of flavour. The orange juice brightens the drink, and the bubbly, of course! To make the Candy Corn Syrup: Place 3 Tblsp. candy corn into a jar with lid. Cover with 4 ounces of rum. Let sit overnight, shaking intermittently. Strain. To make the cocktail: Pour 2 oz. of candy corn syrup and 1 oz. of orange juice into a glass. To taste, add bubbly, adding more if you like a sweeter cocktail, and less if you want something a little less sweet). 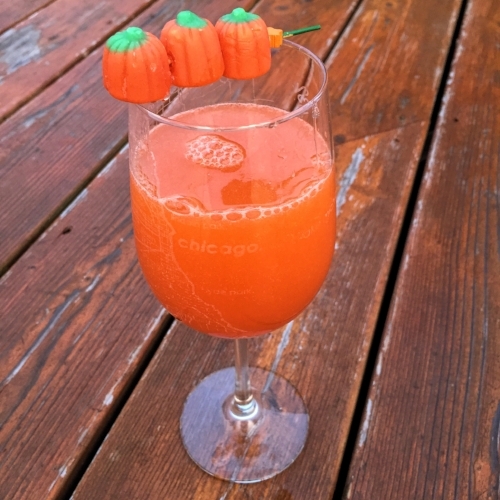 ** Garnish with candy corn pumpkins on a skewer! Melt the Cachaca and peppermint patties in a saucepan, stirring frequently, until completely melted and combined. Remove from heat and let cool completely. In your coupe glass, squeeze in lime wedge and fill the glass halfway full with crushed ice. Pour the peppermint patty mixture over the ice and add a splash of club soda. Garnish with a peppermint patty and some mint. *You can use white rum, which is traditionally used in a mojito. White rum is a little richer in taste, as it's made from molasses, and not fresh sugarcane juice. Cocktails are meant to be fun! Use the above recipes as guides to incorporate other candies in cocktails, and remember: It's okay to trick-or-treat at any age...especially in the name of cocktails! We make fun, themed, and seasonal cocktails all year long! Check out our upcoming events and classes here!